In last night’s debate, Obama and Romney spent time on foreign trade with China, but the Republican nominee also cited another region. “The opportunities for us in Latin America, we have just not taken advantage of fully. As a matter of fact, Latin America’s economy is almost as big as the economy of China. We’re all focused on China, but Latin America is a huge opportunity for us.” Under President Obama, a controversial free trade deal with Colombia went into effect this year, despite continued killings of labor leaders and concerns about human rights abuses in the country. And next week, a trade deal with Panama will go into effect. Anti-corruption advocates have criticized Panama for providing tax havens for wealthy corporations and its policies have drawn protest from within the country. 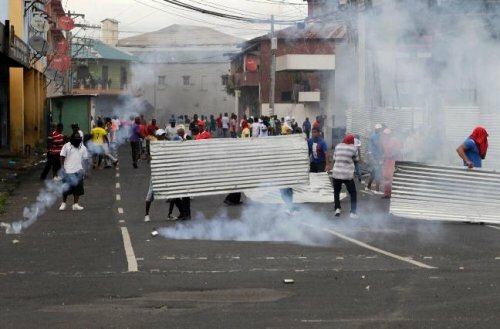 This week, residents of Colon are under a curfew after protesters hit the streets in response to the government’s plan to privatize land. A video posted on the Panama News site shows police in Colon, with weapons drawn, kicking and punching a man who lies on the ground. Shots can be heard in the distance. The response from police led to the death of at least one person, a nine-year-old child last Friday, according to Reuters. For more, we’re joined by Larry Birns, director of the Council on Hemispheric Affairs. He joins us from Washington DC.